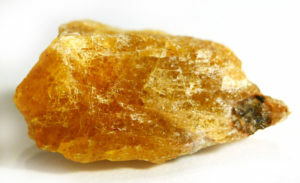 In spite of its modest appearance, cancrinite is a surprisingly powerful crystal. It aligns, balances and “lights up” the Chakras, if is brought into the field of each one in turn, and particularly opens the Sacral and Throat Chakras. It can create a shield of golden light and a strong connection with the Earth, offering protection when working beyond the confines of the physical body. Cancrinite cleanses and clears, both energetically and physically. It can aid meditation by centring and calming the mind. Cancrinite forms in syonite, (a granitoid with less than 5% quartz; if the quartz is in greater quantity, it is considered granite). It is usually massive and rarely crystallises, although when it does, the crystals can be quite stunning, resembling members of the beryl group. Named for Count Egor Frantsevich Kankrin (Georg Cancrin) (1774 –1845), Russian Minister of Finance.